GREEN BAY, Wis. — NBC26 a part of the E.W. 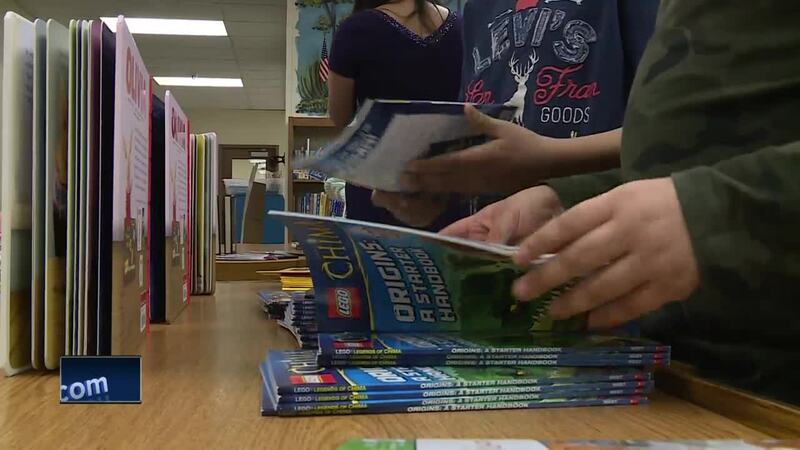 Scripps company has worked together to give books to children around the nation. As part of National reading day, and the "If you give a child a book..." literacy campaign, we were able to offer books to students at Doty Elementary school in Green Bay. It's all in hopes to spark children to have a life long love of reading, principal Natalie Nienhuis said "I'm extremely excited for the donation of the books for our students, one of the things we work hard on with our kids of course in literacy but also knowing when to pick the right book, it was really interesting to see the kids what they gravitated to." Students were able to pick any book, even books in Spanish. At Doty Elementary, more than half the students are Spanish only speakers, "wonderful to have a selection of books in Spanish those are hard to find and those are high interest books," said Nienhuis. It's something students will cherish, Nienhuis said, "I think you saw the joy of just being able to just choose a book but take a book home, more than one child was like do I have to give this back, is this for me? Some of these kids don't have a lot of books in their home so I think getting a new book is even more special." Studies show, students who read well by the end of third grade, are more successful both in education and in life. For more information on the Scripps Howard Foundation, click here.